Hiring a designer can save you time, money and help you end up with a look that is tailored to you and your space! It may seem like you have tons of time to work out the details but if you want to get rid of your ugly carpet before your mother-in-law comes for the holidays, now is the time to start. What can I do to make my flooring renovation more affordable? Renovations are expensive, there are a few ways that you can make the process more affordable. 1) Prioritize your needs. Going in, know that you can't get the best quality AND the most current look AND get it for a steal. You may be able to get an affordable option with a cutting edge look, but it won't be top of the line. This goes for tile, carpet, LVP, laminate. If the durability is the most important thing, know that you may need to compromise in another area. If your overall design needs this look to make it work, you may look at options with shorter warranties or overall less quality. 2) Ask your sales person to do some parts yourself. Most quotes will include things like furniture moving, removing and reinstalling baseboards or removing existing carpet. You can save some moola by bribing your friends and loved ones to do it. 3) Do something original with a simple product. Basic subway tile is VERY affordable but you can upgrade the look by changing the direction or pattern from the standard choices. You could use a standard 3" hardwood and have it installed at an angle. Find out what is in your budget and get creative about how its installed. The Design Firm: What is it and Why Should You Care? Martensville's Pon's Kitchen has gotten a total make-over. Now it looks as good as the food is! So much goes into finding the "right floor", let the pros offer some insight into the difference between the right pick and the wrong one. We're Still Here to Help. Nightmare scenario: you've taken the time to pick the perfect floor, it's better than anything you could have dreamed; then out of nowhere: BAM. Panic. "Why does it look pink? "; "This is not the size I chose! "; "The sample didn't have this pattern! "; "This carpet has a streak through it"; "The back splash was supposed to be straight lay". 1) Find your inner calm. As much as it may feel like it, flooring is not a matter of life and death. It's a huge investment and in this scenario it has gone tragically wrong. That IS stressful, but we deal with this stuff often enough to know what steps to take next and how to get the problem rectified. Take a breath, slam a shot of whiskey or espresso or whatever you've got to do before step two. 2) Whatever step the work is at, put on the brakes. Don't wait until it's all installed thinking "maybe I will get used to it when it is up" or "well it's kind of close". If your gut says no, just hold off. Waiting to say something NEVER makes it easier, it always complicates things. ESPECIALLY when you get involved with manufacturer issues. You are not a crazy person, problems happen. Our installers will understand, we will understand and bottom line we all just want our customers to be happy. 3) We'll come check it out. We will want to see what the problem is, depending on the issue, sometimes we will bring the product rep or the installer for another set of eyes. Every flooring issue falls into one of three categories: Environment, Install, maintenance. We usually try to get on site as soon as possible, sometimes that means the same day and sometime that means within the week. When on site, we make our own assessment of the problem, sometimes compare with the store's sample, sometimes measure for replacement, sometimes scratch our heads and figure out who else we will have to call. 4) We work with you to figure out a game plan. This part can take the longest. I usually start by asking my customers "in an ideal world, how would you like to see this work out?". It can take a lot of different parties working in concert to get anything completed. Sometimes the solution involves getting the supplier to manufacture new product, sometimes waiting for a different installer to be free, sometimes for the customer to decide on suitable replacements. It really depends on what the problem is initially on how long it will take to fix. 5) we fix it. Flooring is a long term product for your home and worth taking the time to get it right. I always try to communicate during the entire process about timelines and expectations. A lot of our customers leave happier after an issue than when there is not one, we go the extra mile to make it right. We always find a way to keep our customers coming back and happy. It's never easy or comfortable to fix these kinds of issues. They don't happen often enough for us to have a "one-size-fits-all" solution, it takes time and brain power. We are smart people and custom is what we do, we're not afraid to get our hands dirty figuring out the tough stuff. If you have any questions about your flooring issues, please ask away in the comments. Masterpieces take time, and we are happy to say we are finished our work on this house. The home owners are set to move in one week from now. This hasn't been a job without significant speed-bumps. With the help of the 6 installers we've had on site and our support from our suppliers we have overcome the hurdles (like 90% complete, 10% to go). This home is the epitome of custom details. Flush mount vents, custom stair nosing, heated tile floors, niches, features and custom showers: from floor to ceiling the master workmanship is evident. Overall, everything works together in concert for a cohesive look. Here is a recent kitchen we've been working on. It showcases the epitome of the look we are seeing more and more of. I love the idea of taking a simple tile and changing the look with a custom install. It gives a human touch, an artesan quality. For a while with backsplash, it was considered the jewelry for your kitchen: the more bling the better. That's just not the case now. We are seeing more and more large format, minimalistic looks, simple non-distracting colors, textures and finishes. Simple tiles with skilled installations. That said every space is different and there is a space for every tile we sell. This is just a look we are seeing emerge. 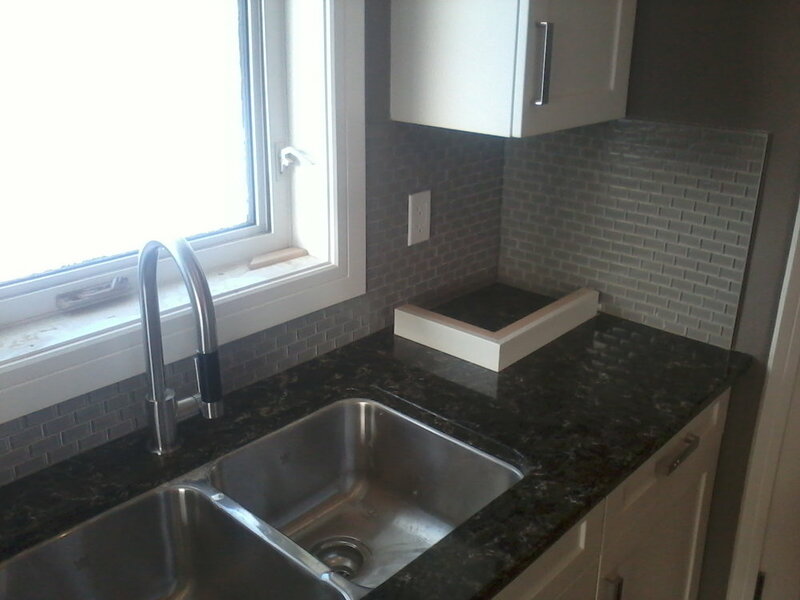 Back splash is where you have the most opportunity in your home to use a bold tile. I wanted to feature a few different looks in this post that highlight the variation of options out there. These pictures are all local and show work completed at our store. From flashy mosaics to understated classics, mini bricks and hexagons, we really have seen it all. It's a small space that can make a big impact on the overall look and feel of a room. Photo credit, again, goes to the man himself, our in house master tile setter, Tadas Kubilis. Thank you again for lending us your portfolio. Not all flooring suppliers are created equal. Each has developed to find it's niche in the local scene. Every store also has different alliances and deals with their suppliers. The product you end up putting in your house could have a lot more to do with your choice of flooring store than what you walked in the door wanting than you would think. Here are some tips to help you get what you actually want out of your flooring. TIP 1: DO RESEARCH AHEAD OF TIME. Have a good idea of the "look" you are trying to achieve before you walk in the door. You should have an idea of budget and style when you start shopping. Otherwise you may end up with whatever that store has in stock or maybe product that more accurately represents your sales person's tastes than your own. Bring inspiration pictures from Instagram, Houzz and Pinterest that will help communicate your ideas. TIP 2: SHOP STORES FIRST AND PRODUCT LATER Before you commit to anything, go to a couple of stores. Different stores will have different offerings. Some have 1 year install guarantees, some have financing, some offer extended warranties, some stock product so you can see exactly what you get and don't have to wait for shipping. At Allied, we have a designer on staff, our store has a huge focus on home fashion, we have a low call-back rate, we aim to make renos effortless for our customers, we are a small operation and can be flexible, we are committed to getting unique looks. Ask questions about the company and make sure they seem reputable, knowledgeable and willing to go the extra mile for service. It's good to know. TIP 3: STAY FIRM TO A LOOK BUT OPEN TO PRODUCT Every store has different relationships with their suppliers. You may want "Kraus Carlotta plank in Westbury HIckory" but not all stores will sell Kraus products and not all that do will have the same access to price points. It may be worth looking at other flooring options. Suppliers offer limited time promotions to preferred dealers and sometimes have ongoing special pricing for specific products., It's worth being somewhat flexible on your choice when you can get more bang for your buck by benefiting from the store's specific allegiances. TIP 4: DON'T ASK FOR A DEAL Well, Don't ask for a deal until the end. When you start out asking for a deal, you will only get shown the least expensive products. I find people often ask for cheap, but are really more interested in value, making their money have the biggest impact. If you ask for deals right off the get-go, you will limit your options immensely. It's in your best interest to be honest about your budget, but there are a lot of options out there to cut costs down. It's best to get the right look and fit for your space. Maybe that means opting for a vinyl tile instead of ceramic so you can cut down on sub-floor and install costs or do a smaller area to feature the look you want. TIP 5: LET THE SALES PERSON DO THE LEG WORK Instead of pouring through samples, flipping through seas of grey and brown, let the sales person show you a few things that match what you are looking for. They will find options that will technically/mechanically work in the space and probably have a better idea about how to navigate through displays. They will also likely avoid product that has historical issues with stock, manufacturing defects and unfair pricing. If that sales person is good at their job, they will also have a basic understanding about supplier alliances, promos and pricing. The sales person should also be able to tell you how the product will perform in the space you've picked. "No you shouldn't do hardwood in front of your bathtub"; "Maybe that wall tile, won't be best for your floor"; "You have how many kids? maybe get a stain resistant carpet"; "That gloss tile could be slippery"; for some examples. If you have any other questions or want to share about your experience, please leave a comment below!